The third highest ranking Wyoming Highway Patrol official is under investigation for an improper photo involving him and a bison in Yellowstone National Park. According to the Casper Star Tribune, Highway Patrol Major Keith Groeneweg posted a photo of himself to Facebook, depicting him sneaking up on a resting bison bull. You can see the photo above. 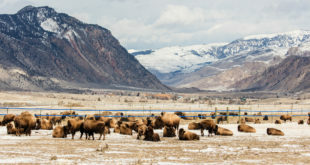 Visitors are required to stay at least 25 yards away from bison and other ungulates, as they are very territorial and have been known to charge and gore tourists. The investigation comes after a busy summer in Yellowstone when an unusually high number of visitors, most from outside Wyoming, have approached wildlife too closely. Rangers for the National Park Service, which is celebrating its centennial this year, worked hard to educate people about wildlife rules. Nevertheless people have been gored, mauled and chased by bison, bears and elk. Pete Webster, Yellowstone’s chief ranger, said a handful of people shared pictures of Groeneweg’s Facebook post with park officials. Rangers continue to investigate, he said. 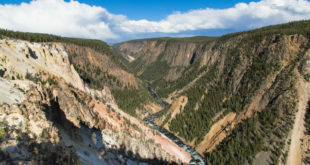 Wyoming Highway Patrol Col. Kebin Haller said Groeneweg was forthcoming to him about the Yellowstone investigation and is cooperating with the park. Groeneweg told Haller the picture was taken during a vacation last week. A ravine cut between him and the animal, although the photo doesn’t show it, Haller said. Haller said he believed everything Groeneweg told him and the major is not on any kind of administrative leave. Haller will obtain a copy of the investigation once it’s completed, he said. Webster added the 25-yard rule—100 yards in the case of wolves and bears—is as much for the animals as the people. “It’s to allow wildlife to roam free on the land, stress-free,” Webster told the Tribune.